In addition to making 3D and video based educational software, MindSpace Solutions has conducted extensive research into maximising the value of 2D educational software. We beleive that each of these three solutions (2D, 3D and video) provide different advantages. Therefore the correct educational tool should be chosen for the correct educational task so that togeather they form a comprehensive solution. GamED is focused on developing 2D educational software that allows students to learn by doing and exploring in a guided way. 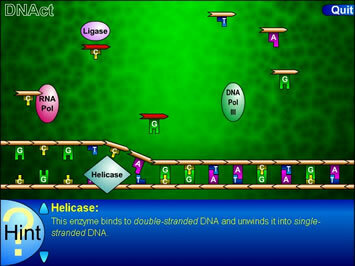 For example, in DNAct, students learn by actually replicating a strand of DNA using components "drifting" in solution. All information is provided in context to the task and it is up to the student to discover the information they need. GamED software is developed on Macromedia Flash, which can be delivered via the internet or on CDROM. It can even be used as an extra stream of media in X-Stream presentations. GamED also allows every action to be recorded to a database, which can be thoroughly anaysed to gather information like the progress, ability and weaknesses of the user, or class as a whole. This is being made SCORM compliant. Take a look at a couple of GamED learning modules we have created - DNAct and Recursive Returns, and try them for yourself. DNAct is the product of the original GamED pilot study, which was designed to trial and refine the techniques that can now be applied to any topic. Both qualitative and quantitative evaluation was conducted with high school students to assess clarity, user acceptance and educational effectiveness. This revealed that the application elicited considerable enthusiasm and substantial educational benefit. Using our existing learning modules in their current form. Developing new learning modules based on the concepts and codebase of GamED.